Our very own James Mundy, stalwart of the InsideAsia team, goes in search of peace on Myanmar’s magnificent Inle Lake. This article first appeared in issue #1 of East, the Inside Asia Tours magazine. Click here to download a copy or sign up to receive your FREE paper subscription. The outboard motor was on full throttle as we headed towards Inle Lake. As the sun gradually sank behind the trees and dusk encroached, our guide swung a lantern over the prow of our boat. In an instant our world shrank to a few metres’ radius; its glow did not extend to the riverbanks, which were swallowed up in darkness. The channel narrowed, the engines were cut, and all was silent. Taking up his oar, our boatman propelled us along in the traditional Inle fashion, gripping the oar with one hand and using his ankle to guide its movement through the water. Without the motor, the noises of the night were suddenly clear: the chirp of the insects in the bushes, the rustling of the trees, the soft splash of water against the little wooden boat. From somewhere in the distance, the sound of chanting drifted faintly across the treetops, while fireflies danced across the water like sparks from a fire, illuminating the green channel in their wake. At length we emerged from our channel onto the lake – though its true scope couldn’t be guessed at in the darkness. 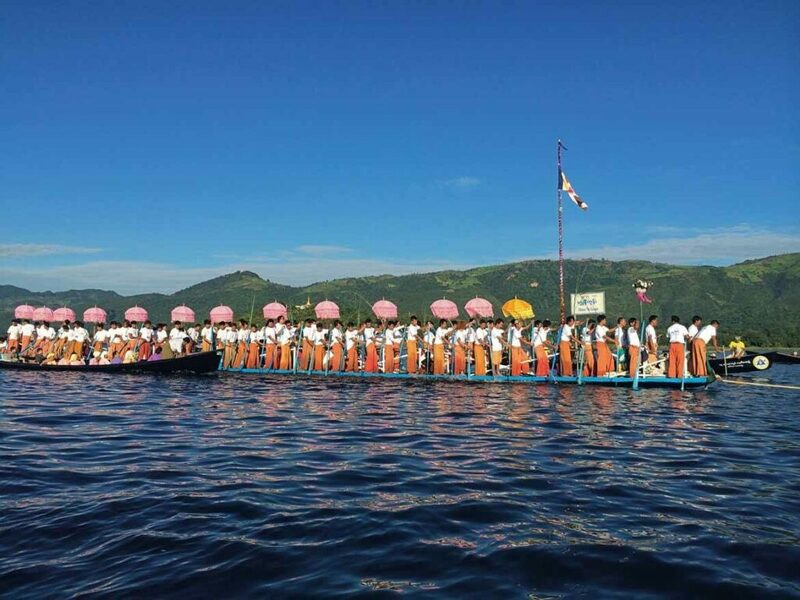 Gradually the chanting grew louder, until all of a sudden its source became apparent: a wooden temple perched on stilts above the waterline, where the faithful were marking evening prayers in their eerie, melodious way. It was then that I realised Inle Lake was going to be something special. Inle is vast. A silvery-blue expanse surrounded by the green peaks of Shan State, this is no boating lake in a local park. We’re talking approximately 120 square kilometres of fresh water, with boats crossing to and fro across its surface, chugging from village to village while entire communities go about their day-to-day business suspended above the water. It is a city without roads. 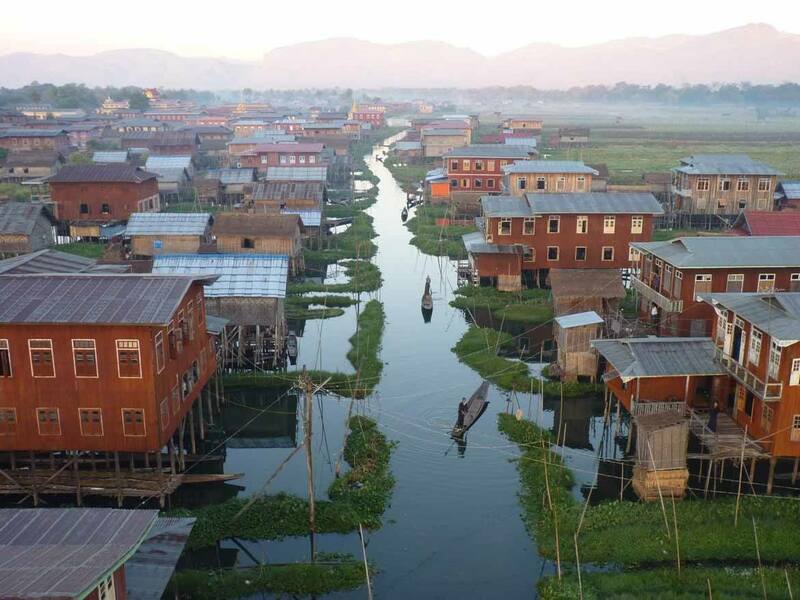 The people of Inle call themselves Intha, and have developed ingenious methods for survival on the water. Their famous leg-rowing technique was developed so that the oarsmen could see above the proliferation of plants that grow on the surface of the water. Lake farmers, meanwhile, grow their produce in floating fields constructed out of weeds and anchored to the lake bottom with bamboo poles. These rise and fall with the water level, providing a farming solution that is both abundantly fertile and resistant to floods. My hotel was constructed in the same method as a traditional Intha dwelling: built from sturdy, long-lasting teakwood and balanced on stilts above the lake surface. In low season these houses tower above the water level; at high water the lake can almost lap their doorsteps. Arriving under cover of night meant that my first view of Inle’s full splendour came in the morning – and what a view it was. This was the transition period between the rainy season and the dry season, and the weather was teasing us with the possibility of a storm. As I tucked into my mohinga (a traditional breakfast dish of noodle soup), angry black clouds replicated themselves in the glassy water, giving the disconcerting impression of infinite depth both below and above. It was all bravado, however. The storm blew over without so much as a spot of rain, and it wasn’t long after sunrise before we were out on the water again, cutting along past solitary fishermen casting their nets and longboat taxis packed with people in traditional dress, waving and smiling at us as we passed them by. The further we travelled, the more crowded with boats the lake became, until the atmosphere was charged with excitement. It was still before nine o’clock yet here we were, jostling past hundreds of other boats for a peek at what everybody had turned out to see. Eventually, we pulled up alongside a shallow wooden barge carrying about 40 or 50 young oarsmen, each dressed identically and shaded by brightly coloured umbrellas. The resplendent crew glided past us, slicing the water in perfect unison with their leg-driven oars, to be succeeded by a procession of more and more of the same, each sporting their own colours and rowing to their own music. Finally, at the tail end of the convoy, came a great golden barge styled in the shape of a giant bird, carrying its own shining, gilded shrine. 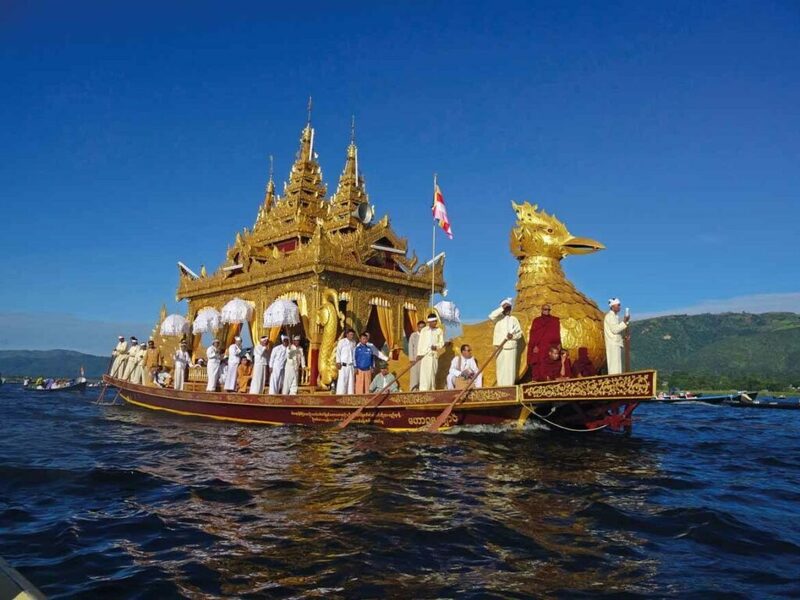 A glimpse of this barge and its precious cargo, the four sacred Buddha images of Inle Lake, was what everybody had been waiting for. Taking place over 18 days in October each year, the Phaung Daw Oo Pagoda Festival is the largest celebration in Shan State – and one of the most important in the whole of Burma. Over the course of the festivities, the gilded barge is brought to each of the lake’s villages in turn, stopping at each for a night of music and dance, boat races and general merry-making. Looking about us, the sheer number of boats that had congregated was immense. There were boats filled with monks, boats filled with members of different hilltribes (identifiable by their distinctive ethnic costumes), boats filled with young and old, and the occasional boat carrying foreign tourists like ourselves. All of Inle’s magnificent diversity was on display, packed into one small area and united by their common enjoyment of the yearly festivities. 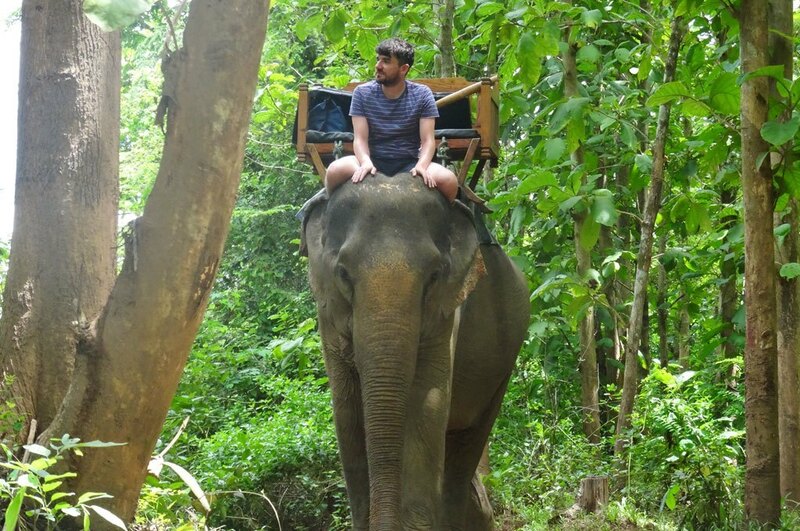 vines, I expected to see snakes and exotic wildlife – or at least some other tourists – but all we came across were a few wayfaring pigs. Some claim that Inle has already become a victim of its own celebrity, but I disagree. It is true that development is continuing apace to cater to demand, and that some of Inle’s “attractions” smack uncomfortably of exploitation (avoid the Padaung “giraffe women”, and the inauthentic floating market), but I found plenty at Inle to be genuinely impressed by. Exploring the lakeshore by bicycle or taking a kayaking trip to one of the lesser-known stilt villages is a fantastic way to strike out from the well-worn tourist path, and there is always a corner of peace out on the vastness of the water. As ever, it is the quieter, little-known parts of the region that remain its most beguiling. After the sun sinks over Inle and the last of its dying light has vanished from the lake’s great glassy eye, there is little for us to do but return to our lodge. There are no floating bars or clubs to tempt the weary traveller – not yet, at least, and hopefully not ever. Retiring to the veranda of my stilt cottage with a glass of the local red in hand, I thought how nice it was to have nothing – literally nothing – to do but listen to the gentle lapping of the lake and look forward to another day on the water. Our Magnificent Myanmar Small Group Tour combines three days on the lake with Myanmar’s most celebrated and some lesser known destinations: Yangon, Bagan, Mandalay, Kalaw and the impressive Loikaw. 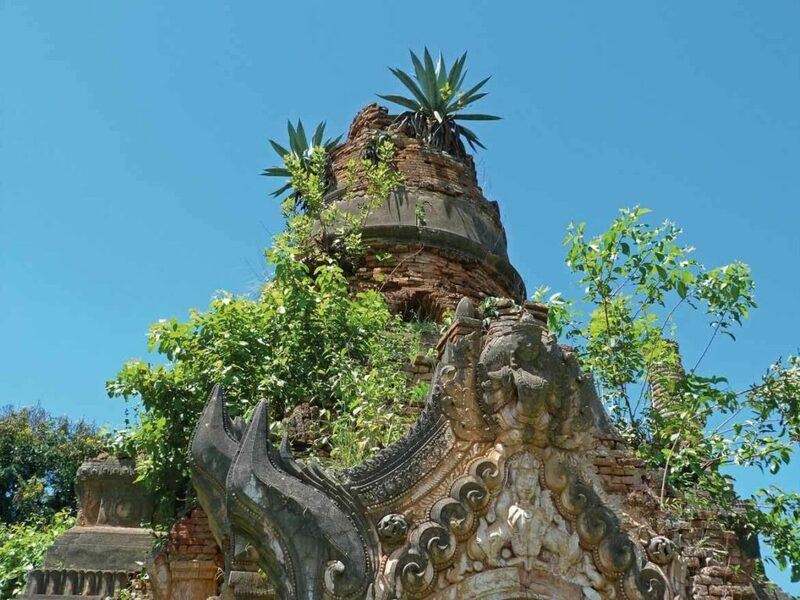 Alternatively, you can include Inle as a destination as part of any tailored itinerary – just get in touch with our experts to start planning. 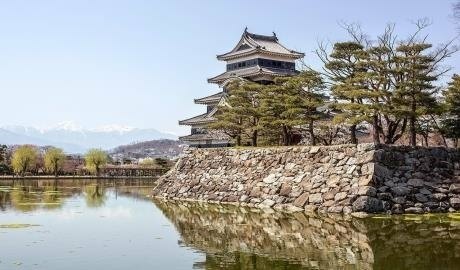 This article first appeared in issue #1 of East, the Inside Asia Tours magazine. Click here to download a copy or sign up to receive your FREE paper subscription.